Items in the “Territories” category include the buildings and structures located on them, which are designated according to their use. 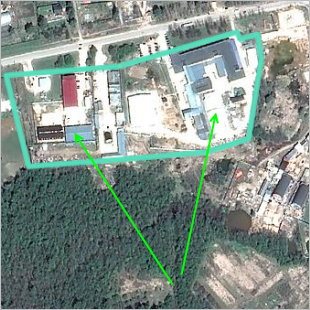 For example, the territories of educational institutions (academic buildings, dormitories, etc. ), industrial zones, construction areas, beaches, etc. When drawing or editing “Territories”, use the techniques described in section 2.7.3. Simple polygonal items. Draw territories of organizations and institutions in cases when they are delineated from the surrounding area (by some sort of artificial or natural barrier). Draw polygons without including too much detail: sections of the polygon that appear straight when the map is zoomed in all the way should be drawn using two points. When you draw Industrial zone territories, you can use one polygon to represent a separate (fenced off) territory or a whole industrial block that includes several adjacent industrial territories. Assign garages to their own territories (as Industrial zones) if they are named garage co-ops or major garage complexes (regardless of if they have an official name). 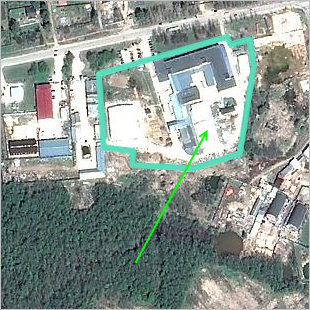 Unnamed garage complexes that are located next to other “industrial zone” territories can be included within the broader polygon for that territory. Draw garages themselves as buildings of the “Structure, building site” category. Don't draw building sites for private homes on the map. When drawing territories, you must observe the mapping rules concerning items that are forbidden to draw on YME. If the polygon representing a territory partially overlaps with a reservoir polygon, then draw the borders of both items. Furthermore, you should merge the borders so there are no gaps between them. Note. For information on drawing overlapping border sections of complex polygons, see section 2.7.4.1. Composite polygonal items: creation techniques. Don't draw territories of underground buildings and structures within their complexes (metro stations are an exception, see 3.13.1.2.4). You can nest territories in cases where the nested territory is part of a larger territory and encompassed by it (for example, if a power plant is on the territory of a factory).